My farmer brother raised chickens again this year, and last week we bought four of them. 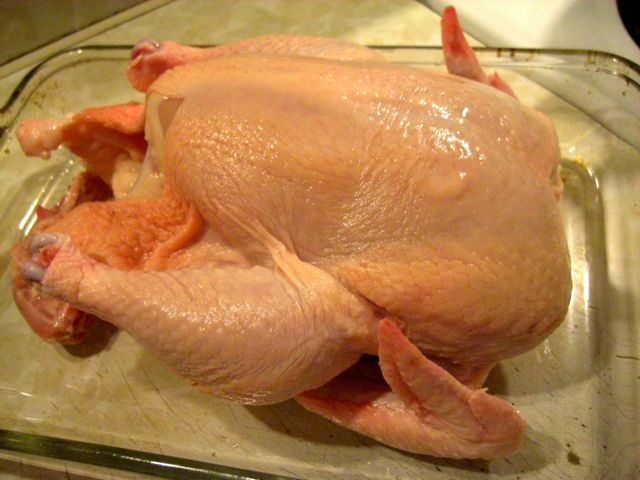 Each of the chickens weighed between five and five and a half pounds, so perfect for roasting. Even though roast chicken dinner is fantastic, I decided I wanted more meal options from all these birds. I took to Google and set out to learn how to cut up a whole chicken. It seemed easier than I thought, so I was really excited to try it. I learned how to divide chicken by watching this short YouTube video. I watched it about five times before I took to work on my chickens. On chicken day, I successfully parted three chickens. The first one took about twenty minutes (maybe longer), as I figured out how the joints worked and the correct angle for the knife. I had the YouTube video called up on my iPod, so I could learn step by step as I worked (while frequently washing my hands). My first attempt wasn't perfect, but it helped me learn for the next one. The second chicken was far easier to part, taking about half the time as I got the hang of it. By the third chicken I was full speed and the breast pieces looked like they were from the grocery store. I was so happy and so proud of myself! Kitchen skills! I also kept one of my chickens whole, so we can have a roast chicken one night too. Very excited. Wonderful, wonderful. I never ate meat, so when I started, I went to YouTube as well. Having Thanksgiving here again tonight. Yum. It's still too hot to have the oven on for a chicken dinner, but soon enough. I know, lots of folks don't like to bake or cook in the hot summer days but I can't help it. I don't mind the hot and I love to bake, way too much. It helps when you've got a good knife! It does. I also got some kitchen shears and they worked great as well. Go you with your mad knife skills!